Treated myself to an album. From our national online classifieds site, got it for a fair offer and it arrived well packed in the mail. Even though the records are protected by the cardboard sleeves of the album, with an older worn album they can get caught in the spine and easily bent and have bits broken out. The cover is a bit faded, but everything is fine and the 5 large 12" records really look like they are new. One of those unexpected questions that happen was the title. This is Antonín Dvořák's Opus 95, 'From The New World' in E Minor. 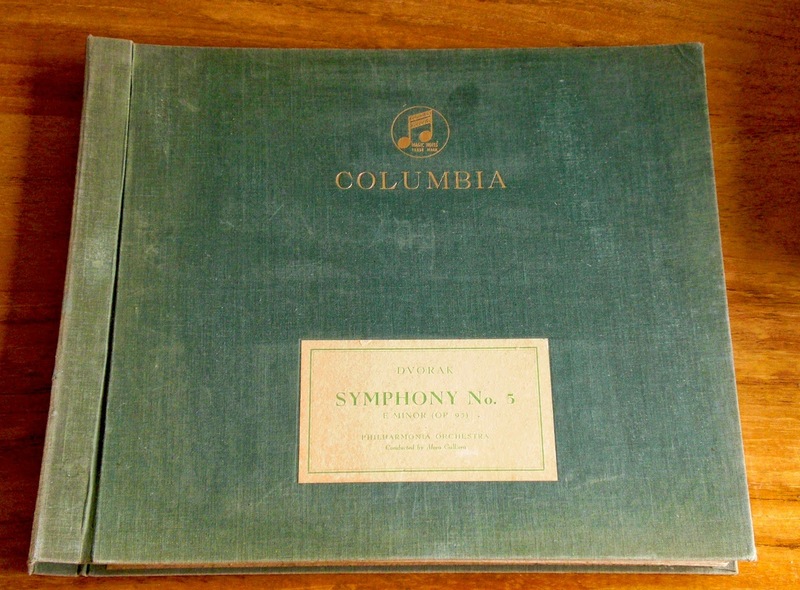 The label on the album clearly states this as Symphony No. 5, but a quick search on the internet makes this Symphony No. 9. Some more reading on the shelves of the vast and varied internet yielded the answer, there has been renumbering going on. The composer himself was 'flexible' on his Opus numbering to start with, but in Symphony numbering this was his No. 5. Then after the composer's death four more symphonies have come to light, later leading to successive renumbering to order of writing. The Symphony No. 5 was first renumbered No. 8 and from the fifties on now known as No. 9. This album is of a performance by the Philharmonia Orchestra from the late forties. The tax code in the run-out makes it '46, the Columbia D.X. series numbering suggests '47 and the tax stamp on some of the records make it '48 - we'll make it 'late forties'. 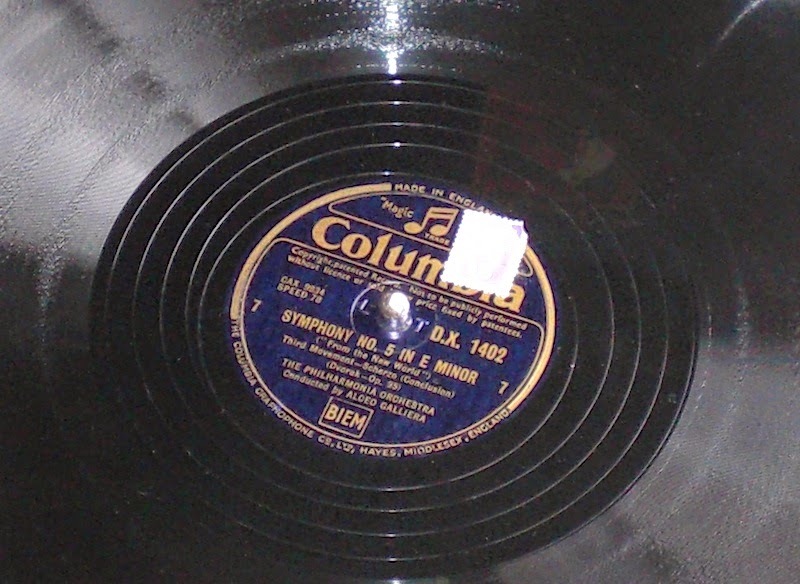 Listening to a longer classical piece on 78's is more active than e.g. playing a CD or an MP3. About every 6 minutes or so the record has to be changed and the gramophone re-wound. Another thing is that you can see from the grooves very clearly when a loud section is coming up.